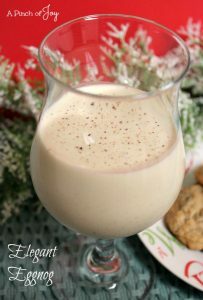 Eggnog is a perfect drink with it’s richness and creamy spiced flavor. It was a special treat at our house for a couple of weeks around Christmas each year. Wheels especially likes it. And then – carb counting entered the picture. At 35 carbs and 340 calories per serving, eggnog fell off the radar. Normally we use don’t use artificial sweeteners – mostly from personal preference. But when I saw this recipe came in at 9 carbs and 100 calories for a four ounce serving, it immediately popped to the top of my “gotta try this file”. You know — that messy, horizontal stack of papers by the computer that grows higher and higher. It is truly an elegant drink. Everything you want in an eggnog – smooth, creamy, great flavor. If carb counts are not part of your life, you can substitute granulated sugar for the sweetener in the same amount. Use a candy thermometer to make sure the mixture reaches 175 degrees. Making eggnog is not as easy as opening a container from the dairy case – but almost! And the taste is waaaay better. And so are the nutrition numbers. The celebration is back in Christmas! Want cookies to go with the eggnog? Twelve days of Christmas Cookies may have just the one you need! Mix together Splenda, cornstarch and nutmeg in heavy saucepan. Whisk egg yolks and add to ingredients in saucepan and whisk until blended. Add milk slowly whole stirring constantly. Cook over low heat, whisking continually until temperature reaches 175 F, about 5-8 minutes. Remove from heat and blend in half and half; cool mixture. Cover and chill at least 3 hours. Add vanilla extract just before serving. Eggnog will keep 3 days in refrigerator.